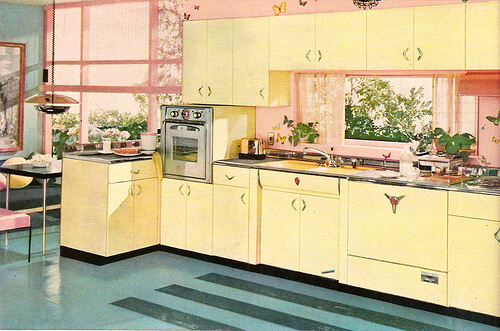 This is the “trend-setting new ‘PIONEER’ by American Kitchen” – 1956 – “color styled by Beatrice West.” I find it so fascinating. It was right about this time that steel kitchen cabinets started to lose their battle against wood. But it was a slow death. And along the way they decided they’d rather switch than fight. 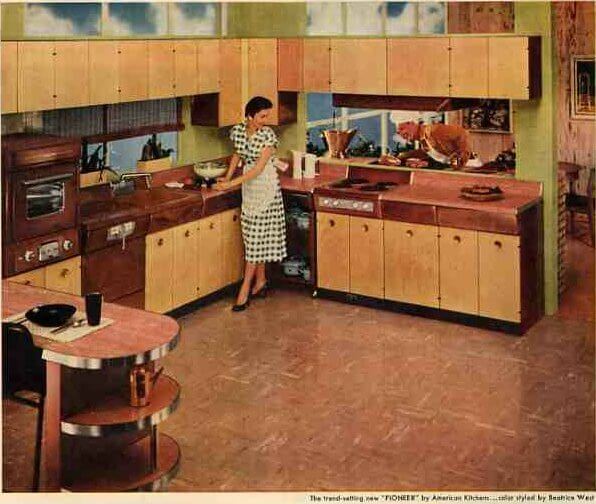 That is, these cabinets have wooden doors…steel drawers – with a coppertone (or possibly real copper???) finish drawer cover… and all steel bodies. Kind of, the best of both worlds. Other makers, like St. Charles and Youngstown show an alternative approach — all wood on the base cabinets, all steel on the walls. I think that one of the main issues they may have been addressing was dented doors. Little Billy on his trike and all. 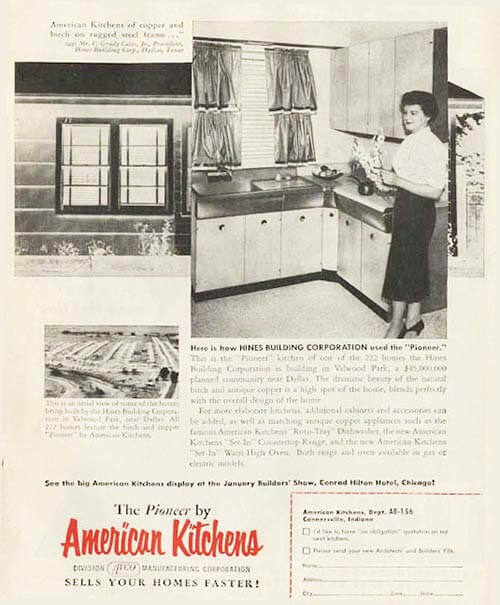 For more elaborate kitchens, additional cabinets and accessories can be added, as well as matching antique copper appliances such as the famous American Kitchens Roto-Tray Dishwasher, the new American Kitchens Set-In Countertop Range, and the new American Kitchens Set-In Waist-High Oven. Both range and oven available in gas or electric models. 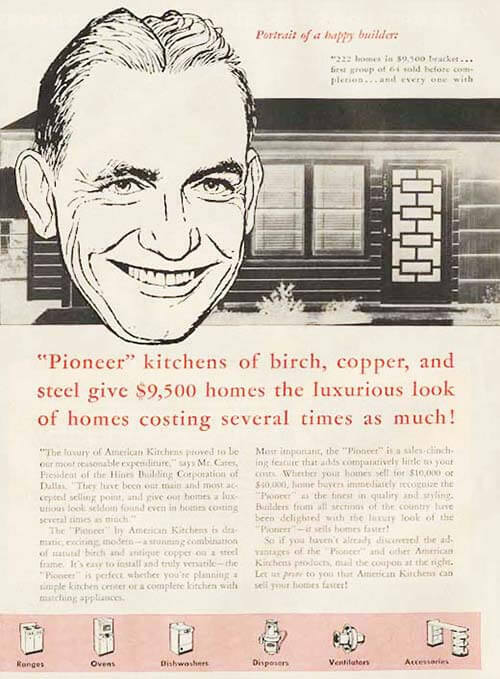 I don’t really understand whether “antique copper” means REAL copper, or coppertone. 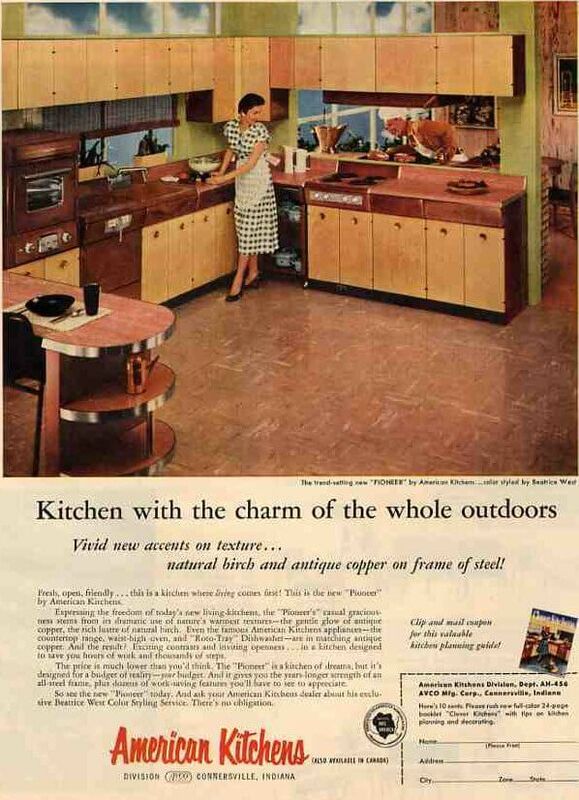 Great kitchen also in its streaky brown floors, cool roller shades, and simple breakfast bar. 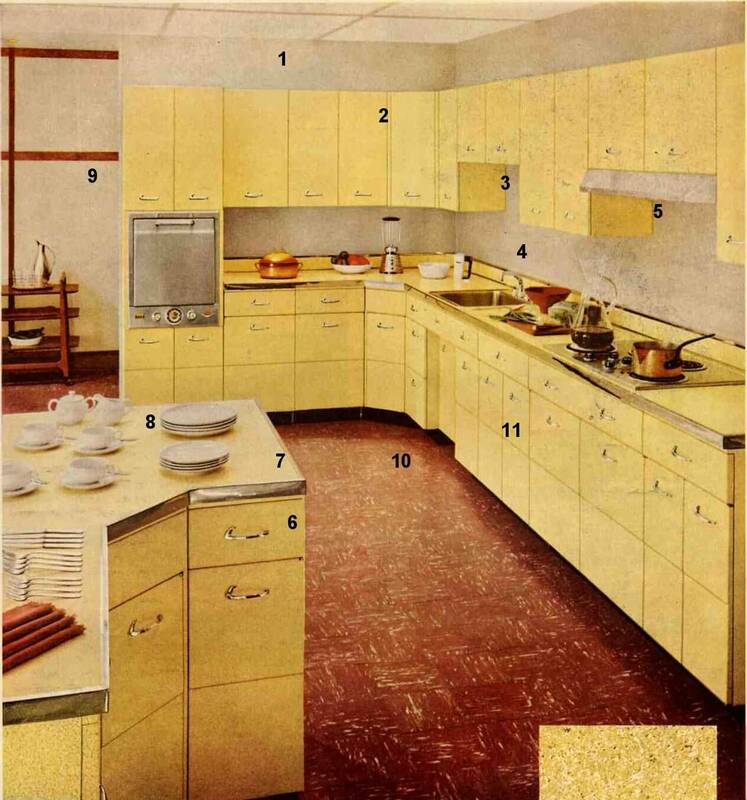 And I even love the chartreuse walls / reddish coppertone / light birch color scheme. Hey, look beyond to the dining room — it’s those pecky-cypress-paneled walls, which we saw last week in the scary kitchen photo. I saw them in another magazine the other day. I’m on the lookout for real now! Oh, and be sure and open the thumbnail, to get the best look hubby on the indoor bbq. JP, is there an inconspicuous place to use copper cleaner on these items? If you try some and the items get clean, its an indiction they are copper but doesn’t make it definate. Holy Crap! 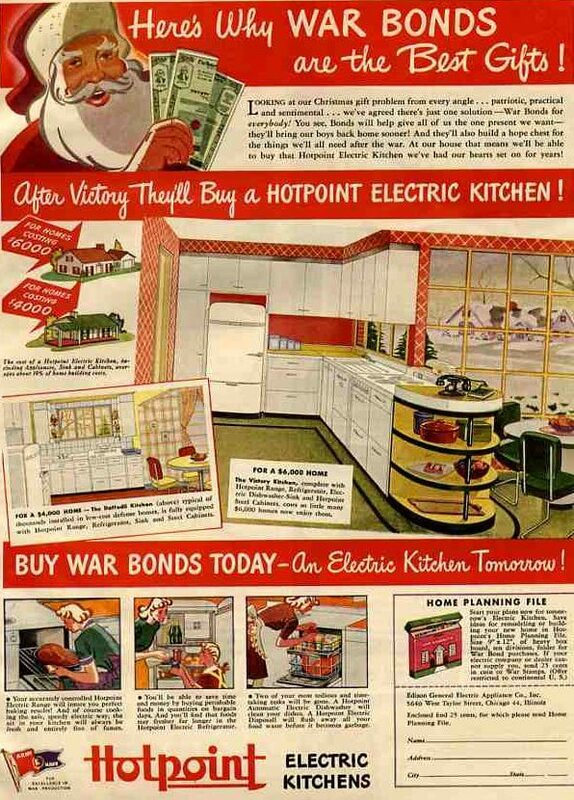 We recently bought a 99 year old house that we are restoring and it has this EXACT kitchen in it. 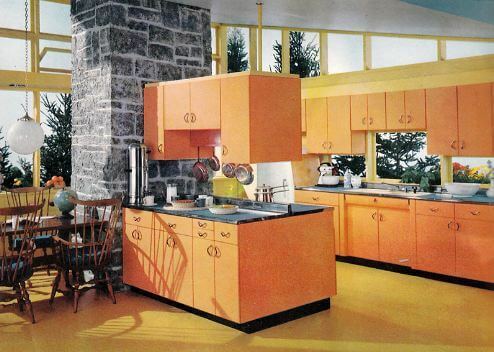 I mean the cabinets, the copper drawers, orange sink, countertops (BOOMERANG- LOVE) and even that funky dishwasher!!! I am so thrilled to find this ad- thank you for posting! Also I have been investigating and I think these drawers are real copper. Mine were gross and covered in junk but after some serious scrubbing with steel wool I got it down to a gorgeous shine! Thanks again- so happy to find this!